Just beautiful! Amazing color work! You coninue to amaze me with your ability to faithfully reproduce complex, microscopic designs. And I love the plumpness of the tomatoes, of course. Where the tomato catches the light and the shine is really great! Love the way each tomato has its own shape - and the plate is lovely. I think you should keep it! The tomatoes are great, and the shadows. But I can't believe the patience in doing the rim of that plate! Nicely done! hmm roast veggies yum. Nicely drawn as always. Left you a reply re FB on my post. Sounds really yum! Great work you make it look so easy. 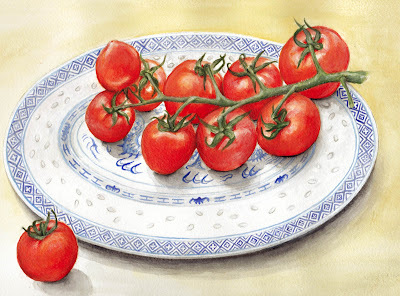 I was thinking the tomatoes would be okay to paint but that the plate would be really hard! Nice job. The plate you drew is AWESOME! This is beautiful work - the shadows on the plate's pattern and the shadows in the tops of the tomatoes are so well done! Tomatoes are tough; I've bungled them up before. This is excellent work. You've done it very well! Amazingly wonderful, especially that border on the plate!! Love the whole deal, but that border is great! Nice tomatoes. I like that they are still on the vine. They look yummy.